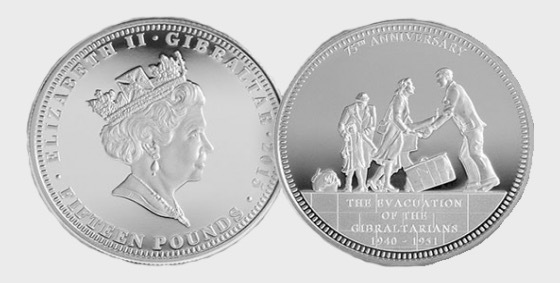 Coin commemorating the 75th anniversary of the evacuation of Gibraltarians during World war II. The story of Gibraltar’s evacuation is one of the few untold stories of the Second World War. This commemorative coin serves to remember the hardships endured by so many Gibraltarians in this time of conflict and we hope it will encourage you to celebrate the ‘Evacuation Generation’, while we still can. Within a matter of weeks over 70% of the total population of Gibraltar was evacuated to French Morocco. Gibraltar’s women, children, elderly and infirm, were torn apart from husbands, fathers, and sons in a time of intense danger. They accepted that hardship with immense courage and as an act of duty and loyalty to Britain.